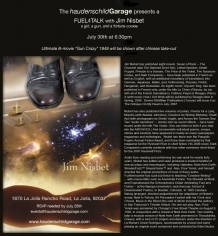 On July 30, 2007 the haudenschildGarage held a FUEL4TALK with author Jim Nisbet. Steve Fagin was the moderator. As part of his presentation, Nisbet read an excerpt from his 2006 novel Dark Companion. Following Nisbet's talk, Gun Crazy, the 1949 film noir feature film starring Peggy Cummins and John Dall in a story about the crime-spree of a gun-toting husband and wife, was screened. Gun Crazy (aka Deadly Is the Female), the forerunner of director Arthur Penn's Bonnie and Clyde (1967), is considered by many to be the ultimate B-movie with film noirish elements. Director Joseph H. Lewis's cult picture was taken from a Saturday Evening Post story by novelist MacKinlay Kantor, and developed from a screenplay by Kantor and blacklisted Dalton Trumbo (credited as Millard Kaufman to hide the fact that he was one of the Hollywood Ten).